The Nintendo Fan: I'm a flying Bee! Again! Today, in the morning, I called GameStop to see if they had Mario Galaxy even thought they said it would arrive the 13th. They said it would be here in about two hours. So I was like "ok thanks". So then, two hours later I went to GameStop and of course-Mario Galaxy was there. They had recieved the copies early. Because I had pre-ordered Galaxy I got the coin with Mario flying and the yellow star named Tyke. The back of the coin has "SUPER MARIO GALAXY" written on it. The coin is also larger and heavier than I expected it to be! It's like...the size of seven pennies! The game so far is sweet, cool, but it has a small problem. I get dizzy very easily in some parts of this game. Oh and the original seven Koopalings (not Koopakids, not Bowser Jr. or Baby Bowser) don't appear in the game which is very sad. But Bowser Jr. however DOES appear. Hopefully, he gets lost in the middle of nowhere in the end of the game. -The original Super Mario 64 "Bowser Stage" music is found in this game again! -F.L.U.D.D. from Mario Sunshine is now an enemy. Actually, look-alikes of FLUDD are enemies (these look-alikes are red and spit fire). -There's Super Mario Bros. 3 music. -The music that plays where you're beating Bowser up is just plain cool. -Urchins from Super Mario World appear in this game! Well, look-alikes. -Unagi the Eel is not in the game but look-alikes (yes, again, look-alikes) are. -Bowser now doesn't spit fireballs. He spits METEOR fireballs. -Princess Peach sends letters to Mario throughout the adventure even though she's very far away. 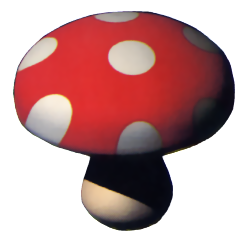 -1-Up Mushrooms don't run away from you anymore. -Penguins from Super Mario 64 are now more common. -There are also two black penguins in the game. -There is a Manta Ray named Ray. Such a creative name! I played 3 hours or so, but I only have 15 stars right now. I picked up my game at wal mart so I could get it today, did not think about the coin, oh well.